Choose from thousands of spaces in Nottingham - including on-street parking, off-street car parks and 56 reservable spaces. Nottingham is located not far east of the M1 – and, coupled with the fact several A roads conjoin in and around the city, this makes Nottingham very easy to access by car. Parking on-street is largely limited to pay-and-display spaces, but there are a good number available at an affordable rate. There are also multiple off-street car parks within the city, making Nottingham a relatively easy place to drive into and visit. Nottingham also has a plenty of park and ride sites – 9 in total – for an alternative way to access the city. Parking is free at all these locations, with you only needing to pay your bus or tram fare to and from the city. 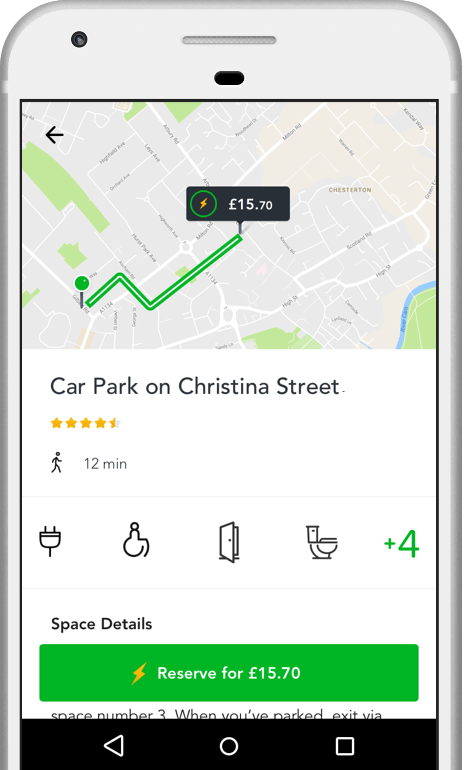 JustPark provides information on a multitude of parking options across Nottingham – including spaces on-street, off-street and those that are reservable, from driveways to car parks. Nottingham is mostly made up of 3 distinct Controlled Parking Zones, with the most expensive and most restricted on-street spaces found in the central zone 1. Each zone offers a slightly different rate of fare, being cheaper the less central it is – so Zone 3 charges (to the west of the city) are particularly reasonable. All pay-and-display spaces in each zone operate from 8am-6pm, Monday-Saturday, with a reduced rate from 6pm-8pm – and no maximum stay is enforced. You can use the JustPark parking map to find information on available on-street parking spaces across Nottingham. There are lots of off-street car parks to choose from in Nottingham, both council-run and commercially-operated. Lace Market car park (Pilcher Gate, NG1 1QE) is the largest council-operated off-street car park. It is open 24 hours a day, Monday-Sunday, but charges a relatively expensive hourly rate for a council car park. However, its central location and its discounted offer when parking between 3pm and 5pm makes this a car park worth considering. You can locate and view availability information for this car park via the search form or interactive map above. NCP also provide 5 car parks within the city, and their largest is great for visitors to Nottingham Playhouse and Nottingham Cathedral whilst still being centrally-located. Nottingham City car park (Mount Street, NG1 6HG) is also open 24 hours a day, Monday-Sunday, and offers a slightly cheaper rate than at Lace Market. Nottingham is also served by 9 park and ride locations that surround the city from all directions, meaning that you can drive in from just about anywhere. Parking at all these park and ride sites is free of charge – so your only cost would be return fare on the bus or tram. JustPark also offer hundreds of reservable off-street spaces across the city of Nottingham, with a particularly good selection to choose from near The City Ground. Nottingham station is the principal railway station in the city and the second busiest in the Midlands for passenger volume. Trains regularly depart to all corners of the UK, as the station is included on multiple national main lines. Nottingham also has a comprehensive bus network and is one of very few cities to have a city tram system in operation. Disabled drivers displaying their Blue Badge can park free of charge in Trinity Square council car park (North Church Street, NG1 4AF) for up to 4 hours – and in any pay-and-display space throughout the city, for an unlimited amount of time, also at no cost. Blue Badge holders may also park on single or double yellow lines for up to 3 hours – as long as there is no obstruction to bus or tram lanes, or where a signposted loading ban is in force. You can also filter when searching on JustPark to show all our parking spaces with disabled access in Nottingham (select this option by clicking on ‘Filters’ on the search results page). Parking on-street in Nottingham is largely limited to pay-and-display spaces, with 3 distinct Controlled Parking Zones occupying many of the city’s streets. Nottingham boasts considerable sporting prowess, and when events take place at the city’s arena and stadiums – principally Trent Bridge, the Motorpoint Arena or Nottingham Forest’s City Ground – driving and parking in the city centre or around the River Trent can become increasingly difficult, due to the central location of each venue. On-street parking charges apply on Sundays at a slightly reduced rate, from 8am-8pm, and charges will also likely still apply on Bank Holidays (unless stated otherwise on signage). Some off-street car parks also offer a discounted rate on these days, but make sure to check in advance at your chosen car park. Overnight parking is available in most off-street car parks in Nottingham, as most operate 24 hours a day. Nottingham has a rich cultural history, being the traditional folklore home of a certain Robin Hood – of which you can find statues and monuments in his honour throughout the city. However, the city has so much more to offer with a sprawling city centre home to many restaurants, bars and the city’s Motorpoint Arena – which holds large scale concerts and events. Sport holds a special place in the city too, with Nottingham Forest’s City Ground and Nottinghamshire Cricket’s Trent Bridge straddling the River Trent and offering further things for you to see and do. Rated 5 stars with an average satisfaction rating of 96%, JustPark is the UK’s favourite parking service. But don’t just take our word for it – check out some of the latest customer reviews for our Nottingham parking spaces at the bottom of this page.